My husband and I have always owned an air purifier. We have tried different brands and styles, but they have all seemed to die at some point, or became too expensive to maintain after a while. After we were married and the last of our air purifiers went by the wayside, we decided to go without for a while. And not until we turned on the Oransi Finn UV Air Purifier did we realize how much we really needed one in our life, and how much of a difference an air purifier can make in a room. 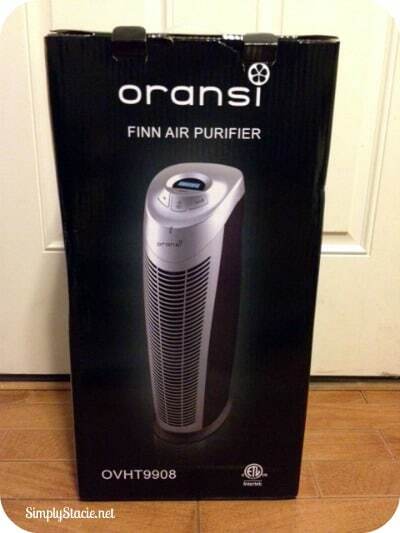 The Oransi Finn Air Purifier is different from the other purifiers I’ve seen. In styling alone, with its sleek and modern look, it sets itself apart from the competition. I like how it has such a small footprint – fitting perfectly between a nightstand and armchair in our bedroom. The Finn covers up to 400 square feet, making it the perfect size for a bedroom or home office. 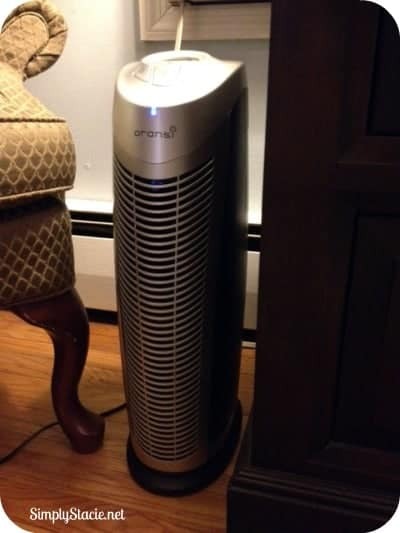 It removes over 99% of mold, pollen, dust, bacteria and pet dander with each air pass. Within an hour of turning on the Finn, we noticed a difference in the air we were breathing. It was really quite refreshing. The Finn features a 10 year warranty for electrical and mechanical issues. Its v-hepa air filter last up to 2 years – a great cost saving feature over other’s on the market. Plus, each Finn Air Purifier comes with two pre-filters included in the box as part of the purchase price. The controls are very simple to use and includes filter replace/clean indicators. On the lowest setting, the purifier is almost silent. The medium and high speeds give off a light white noise that’s actually quite soothing (a great feature if you are going to use this in a child’s room!). The Finn is also energy star compliant – a goal that Oransi has for all its products. Oransi is based in Austin, Texas and focuses on developing green cleaning products, including air purifiers. Their goal is to create products that are better for you, your wallet, and the environment. 5% of their income is donated to promote student interest in science, engineering and math – to inspire a new generation to create similar products. You can learn more about the Finn Air Purifier and other Oransi products on their website. For even more information, you can sign up for their newsletter. i would love the robby wash ball! I’d like to try either of their air purifiers – the Oransi Finn sounds great and so does the v-hepa Max Air Purifier. The Robby Wash ball for laundry would be great. Robby Wash Blue Laundry Ball is something Id love to try! I’d like to try this in my house! We have the Fridge air purifier , but the Robby ball has my interest. Can it be that good? Does it work? I would like to try. The v-hepa Max Air Purifier looks great! The Air Purifier in the giveaway is my fave product! I would like the robby laundry balls. I would like to try the Ionice Fridge Air Purifier. I’d like to try the v-hepa Max Air Purifier. I’d like to try the Robby Wash Fuchsia Laundry Ball Pack. Id love to try The Robby wash blue laundry ball pack. I’d like to try the Robby Wash Laundry Ball. I would like to try the air purifer.